Chateau / Country House602 sq. ft. The house is situated in a quiet, peaceful place is new (2010), has a beautiful park with a large lawn with barbecue. Wonderful indoor pool depending on the season that you can 'use in mid-season saw the water temperature tempered. Ideal for relaxing, but not at 20 minutes drive away from the sea and tourist resorts and crowded. Excellent landscape, open the surrounding woods and the sea to the valley floor. Recent purchase of a wellness area with infrared sauna to relax and purify particular effect with color therapy and aromatherapy and a tub-shower idromasssaggio turkish bath and foot massage, all combined in a gym with treadmills and various tools. What a place! Spacious inside and outside! After the welcome from Marco you feel right at home. If you want peace and quiet then this is the place. About 20min to Finale . We went here for a long weekend of mountainbiking. And what better then an hour climb to the drop-in of the rollercoaster trail and afterwards a relaxing swim in the pool and an evening of barbecuing! Thanks it was a plesaure also for me !!! I hope to se you again ! Perfect house for biking … or relaxing! We stayed in the New House for a 10-day mountain biking trip and it was perfect! The New House (photos 3-8), is a detached ‘mini-villa’ in a very private corner of the plot. It has it’s own parking, covered patio and good size garden (with covered seating and barbeque), all of which are very private and immaculately maintained. The views from the garden and house are amazing – you can see down to the coast, up to the mountains and the castle at Perti! The position also means you can eat your breakfast watching the sun rise and your dinner watching it set! The house is also very well maintained, and is a real home-from-home. The bed (king size?) was super-comfy, so Marco has definitely replaced it since last year/the last comment. Everything was clean and all the essentials were there, such as washing up liquid, olive oil etc. Marco has obviously put a lot of thought and effort into making this a home from home. We stayed there for mountain biking, and it was a perfect base. The house is on one of the best ways to get up to Osteria del Din – an easy gradient road that becomes a forest track. From the Osteria you can go right to Nato Base, and its amazing descents, or left to Roller Coaster and Kill Bill. These routes are in the new Finale MTB guide (Nicola Pisani), which is well worth buying. It’s the 3rd time we’ve biked in Finale and it’s the best biking we’ve done, thanks to Nicola’s book. Although the house is above Calice, it’s only a 20 minute ride up an easy switchback road to the house. Because we were riding we didn’t have chance to use the pool, however, it looked liked the perfect place to relax and take in the sun and the views. Marco was a great host – never intrusive but always on hand to help, e.g. when a storm took out the wifi, which he fixed the next morning (thanks for the wine and jam!). If you’re looking for a quiet, relaxing place to stay, with great views then this is it. The house is pretty much faultless and the outside space is fantastic. Plus it’s only a short drive/ride to Calice, which has supermarket, restaurants and bars. We didn’t see inside the large house, however, although it is semi-detached (Marco lives in the other half), it seemed equally well maintained and private, with it’s own garden and seating area. Definitely the best house we’ve stayed in in the area, and we’ll be staying there again. Highly recommended. Thank you Marco! It is wonderful to condivide what I love with persons like you ....! Thanks for your perfect description, me and Totò hope to See you again the next year......we are waiting for you !!! Marco has an amazing property that is perfect for anyone. We were on a family vacation and hoped to be able to both entertain the kids, experience a bit of the Italian Mediterranean lifestyle, and go mountain biking. Marco's proved to be the perfect spot. The kids (ages 1, 4) and us lived in the pool, played football in the grass, watched the turtles, played ping pong, etc. In my opinion , if the kids are happy the adults are happy! They were so happy there that it made it difficult for us to tear them away to go explore the area. It would be a great spot for older kids, too. The mountain biking (all mountain or freeride style) did not disappoint. We were able to bike to the top of a couple of great trails in about an hour. Many trails were left undiscovered for the next trip, when the kids are older. Research and Garmin route files are recommended to find the starting points. Many trails end in Calice Ligure, which is the nearest town, approximately 6 km away. After a ride in the heat it was perfect to come back and relax by the pool shared only with the occupants of the "New House", Marco and you! My only complaint is that the master bedroom bed was not terribly comfortable. It was one side that was particularly saggy. I think the springs may have broken. It would be nice to have a better sleep on the otherwise perfect vacation! Thanks for your hospitality, Marco! We hope to see you again! We stayed for 5 days in the Large house and enjoyed the stay hugely. The house is in a great setting with a view to the mountains and a glimpse of sea far away. Everything corresponded to the pictures and description and all the amenities were working fine. The garden is very well looked after and the house is in a very good condition. We enjoyed the pool, dinners at the terrasse and the gril, the children were excited by turtles and Toto :) Marco was very friendly, discreet and pleasant host, also very quick to respond to the emails. The beaches near Finale Ligure were all nice (esp the sandy beaches of the Bay of Saracens and Varigotti, also village of Noli), Finalborgo nearby was charming as well. I do not know about the other villas in the region, but I just believe Marco's is the best choice. We'd love to revisit! 20 min from the sea, you arrive at: da Marco. The gate opens and the first things you see is the splendid swimmingpool, olive trees and the amazing panoramique view. The house itself had it all, everything to cook, good shower and again the view from all the windows. In calice ligure, only 10 min away I ate my best gelato and finalborgo is such a marvelous little village, we went there 3 times :-) in one week. So to finalize, perfect holiday for 2 at da Marco. Our Toby has a new friend!!! We definitely come back!!!! My family and I (3 of us) stayed in the ‘New House’, which was spacious, excellently equipped and very well presented. The pool and gym facilities were excellent too. The terrace faces a most beautiful wooded hillside, from where you can sit with a glass of wine just after sunset and admire the fireflies. Marco, the owner, is an absolute gem. He is so helpful, generous and friendly. 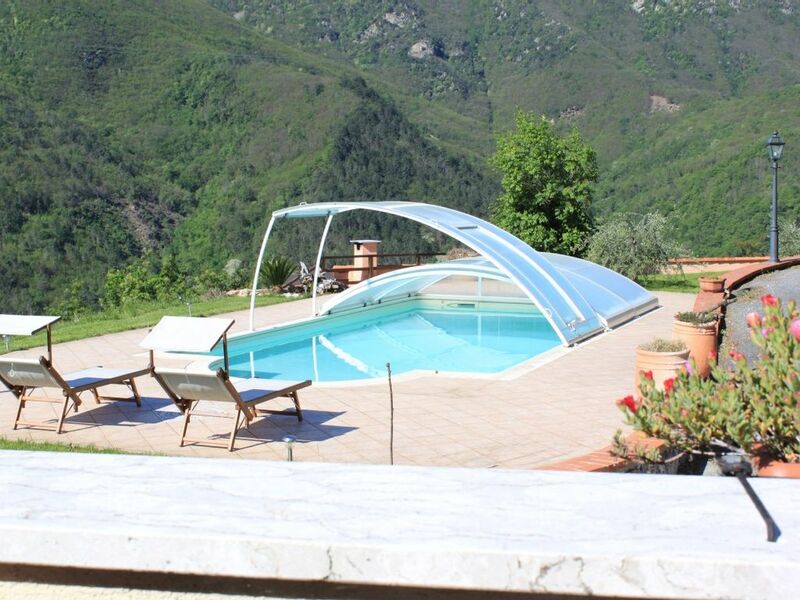 If you like to explore the 'real' Liguria away from the coast, ask Marco. Whether your interest is in walking or visiting interesting places, he'll be able to point you in the right direction. You must try Finalborgo, which is only 10 minutes drive from the house. It's full of historical interest and has some excellent restaurants! We thoroughly enjoyed our stay and were so sad to have to leave. Thanks ever so much Marco. All our best wishes from Rob, Adrienne & Danielle. The house is in open country with a dominant position in the valley, just a few miles from all the services and 9 km from the sea and tourist resorts. The beaches are beautiful, in sand. Many countries of historical interest to visit: Finalborgo Varigotti Verezzi, Noli etc. The beauty of the place is the opportunity to combine a day at sea with an interior that is absolutely delicious: many hiking just minutes from the coast on foot or mountain bike. Melogno of the unique beech, the most 'extended Europe. And after a day in the sun or in the mountains the opportunity to dine in one of the many restaurants. Also interesting is a visit to nearby Genoa and the aquarium and museums with the old picturesque port and the nearby Portofino popular tourist destination. Numerous sporting activities including climbing, sailing, tennis, mountain biking.